Presenting, Adroit District S - an address that is an oasis of calm, peace and magnificence in the hustle-bustle of the city, Chennai. Your home will now serve as a perfect getaway after a tiring day at work, as Adroit District S ambiance will make you forget that you are in the heart of the city, Thalambur. Adroit District S is a large project spread over an area of 5.00 acres. Adroit District S comprises of 1 BHK, 2 BHK and 3 BHK Apartments in Chennai. Adroit District S brings a lifestyle that befits Royalty with the batch of magnificent Apartments at Thalambur. These Residential Apartments in Chennai offers limited edition luxury boutique houses that amazingly escapes the noise of the city center. 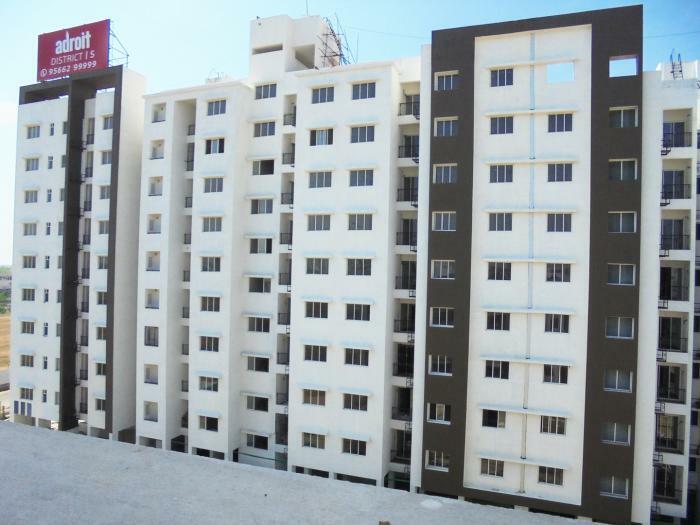 Adroit District S is built by a renowned name in construction business, Adroit Urban Developers at Thalambur, Chennai. The floor plan of Adroit District S presents the most exciting and dynamic floor plans designed for a lavish lifestyle with 4 floors. The master plan of Adroit District S offers people a strong connection to their surroundings, promoting a sense of community whilst balancing this with a distinct private address for individual homeowners. Amenities: Out of the many world class facilities, the major amenities in Adroit District S includes Landscaped Garden, CCTV Cameras, Swimming Pool, Gymnasium, Play Area, Intercom, Lift, Club House, Car Parking, Gated community, 24Hr Backup Electricity, Vaastu / Feng Shui, Multi-purpose Hall, Security and Video Intercom. Location Advantage: There are number of benefits of living in Apartments with a good locality. The location of Adroit District S makes sure that the home-seekers are choosing the right Apartments for themselves. It is one of the most prestigious address of Chennai with many facilities and utilities nearby Thalambur. Address: The complete address of Adroit District S is Palandi Amman St, Thalambur, Tamil Nadu 603103. INDIA..
No.80/8, Thazhambur Main Road, Thazhambur Village, Chengalpet Taluk, Kancheepuram District. progressive thought that powers the innovation behind our buildings. ADROIT URBAN DEVELOPERS is an EXCELLENT builder. It has 10 on-going projects with total inventory value of Rs.489 Cr and 3 completed Projects. Wash area flooring - Anti-skid floor tiles* & wall ceramic tiles* up to 3'0"
Ask from 8 other people who enquired about Adroit District S.
Review of Adroit Urban Developers, OMR? construction quality, trustworthy, delivery history etc.? Review of Adroit District S, OMR location? neighbourhood, connectivity, schools etc.? Comparison of Adroit District S, OMR to nearby projects? Is it rightly priced? What is your feedback on this Adroit District S, OMR? Depends on brand name and complete the project in time etc? Will this be a better option for investment or to live in Adroit District S, OMR? Can you give some suggestion? Is the Adroit District S, OMR has more potential in terms of capital appreciation, ROI, Rentals, Proximity to social infrastructure etc?